In March, a hotel GM in Cocoa Beach invited me to stay there for several days. It was the idea of the property management company that had contacted me, way back in 2013, about a position. “Pack a clean set of whites,” had been added at the end of the email. Curious. I did as requested, and headed for the ocean. For the next three days, the hotel’s painter and management company regional director of operations led me around the property. They pointed out surfaces that needed work. They walked me through areas they wanted to improve. They showed me themes and color schemes that the owners wanted to change. And, they made lots of notes on their iPads. The fourth day, we revisited some of those areas. Then, we sat at a small shaded table, and went over the men’s notes. By that time, typed into a hard copy for each of us. Usually, that’s when “the best laid plan hits the fan” (my paraphrase). What the budget can bear differs a lot from the combined needs and wish lists. And, available time and manpower. Not in this case. Everyone at the decision table has been motivated – and ready to move. For example: Here’s what has happened within the last month and a half. A local general contractor was hired to repair and upgrade guest rooms and suites, two restaurants, game room, health club, children’s playground, and part of the conference center. A specialty contractor has signed on to remodel the main kitchen, and public restrooms. The GM has been authorized to add three people to the engineering staff for two full years. All three will start work August 01, 2017. Each will handle specific aspects of the property upgrade. Grounds-landscaping specialist – Redesign and re-landscape the front entrance, nature sanctuary, rest, and walkway areas. HVAC and OSHA specialist – Handle vent system cleaning, filter installation, room thermostat replacements, bathroom fan/ventilation system cleaning and repairs. Painter – Prepping and repainting all areas designated on the improvement list. Each of the three new engineering employees worked previously at, or on, the hotel property. Each is a certified specialist in his or her trade. Each is proficient in English and Spanish. One also speaks and writes Portuguese and Mandarin Chinese. Each is related to a current hotel staff member. Few engineering departments are able to gain three additional workers at once. Fewer have the luxury to employ three specialists at once. It is done more readily in other parts of the U. S. It can be done when both the hotel management and owners are operating on the same wave length. At the same time. An exciting thing to see in action – to be a part of – when it happens. From: Somewhere Safe with Somebody Good, by Jan Karon. Copyright 2015. “ ‘Margret clung to the side of the overturned wood row boat. Knowing that her grip could not last much longer. Knowing that she would not make it. And the enraged waters of the North Sea would swallow her. At a later date, Franzen took me on a virtual tour of the church in Bratislava, Slovakia that he’s been working on. It is a small structure, compared to the grand cathedral projects that he has completed in Europe and Canada. And, it holds a significant place in the painter’s life, perhaps in mine also. The church is the home parish of a group of Haytovkas originally from old Austria. Franzen said the upper exterior of the church had not been touched in over forty years. “The surfaces were pitted by thick, pebble-looking layers of grime and pollutants from the large manufacturing plant located less than 1.6 kilometers (one mile) away. Underneath, most of the paint was chipped off. Brass was badly tarnished, and coated with sea salts and bird droppings. For two years prior, he “studied the painting craft” at a trade school run by the Netherlands government. He called the training very intense. By the way, Franzen and his wife are caregivers for their son Gordon (28). He has severe traumatic brain injuries from a work accident in 2009. Something tells me that both Gordon and the historic church structure, built over 250 years ago, are in very good hands. Point to Ponder: A true craftsman preserves the lives of impaired persons and old buildings with equal dedication and selflessness. No. 1. Steel combs. Uses: Dragging, wood graining. No. 2. Palette knife. Uses: Mixing artist’s acrylics or oils; scraping away paint, glaze in areas. No. 3. Dragging Brush/overgrainer. Features: natural bristles one side, thick nylon bristles other. No. 4. Badger-hair Brush. Uses: Smoothing oil glaze. No. 5. Long-haired Spalter. Size 80. Uses: Smoothing oil glaze. No. 6. Short-haired Spalter. Size 100. Uses Applying oil glaze, then smoothing it. Nos. 7-8. Small Spalter/Mottlers. Sizes 40, 50. Uses: Wood graining, smoothing oil glaze. Nos. 9-10. Toothed Spalters. Special oil brushes. Uses: Wood graining. Nos. 11-12. Small, flat Brush/white nylon. Uses:Marbling, touch-ups, freehand painting acrylics. No. 13. Small pointed round Brush/white bristles. Uses: Touch-ups, thicker veining marbling techniques with acrylics. No. 14. Flat long-haired Brush/nylon. Uses: Marbling, fine detailing in acrylics. No. 15. Long-haired Brush/nylon. Uses: Marbling with acrylics. No. 16. Small pointed Brush/nylon. Uses Fine veining when marbling with acrylics. No. 17. Long-haired Ox-Hair Brush. Uses: Marbling, woodgraining, freehand script and ornamentation (lines of varying thicknesses). TIP: Best with oils. Nos. 18-19. Flat, White Bristle Brush. 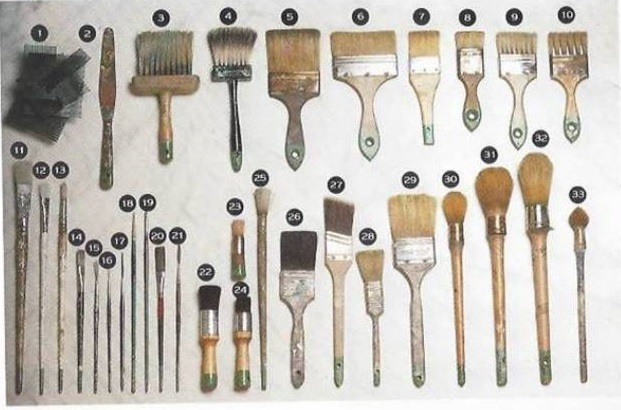 Uses: Marbling, woodgraining, corner touch-ups with oil-or-water-based paints. No. 20. Flat long-haired Badget Lettering Brush. Uses: Marblig, freehand painting. TIP: Oils. No. 21. Ox-hair Sign Painter’s Brush. Features: Long-hair cut flat at end. Uses: Marbling, freehand (for clean edges) in oils or acrylics. Nos. 22-24. Stencil Brush. Feature: White bristles, slightly softer. Uses: With oils or acrylics. No. 25. Round/oval thick nylon Brush. Uses: Spattering; coating thin, curved surfaces. No. 26. Flat nylon Brush. Uses: Paint latex base coat, also acrylic glazes; baseboards, chiseling. No. 27. Angled nylon Brush/nylon. A better quality brush. “Pre-used” in factory, leaves fewer marks. Uses: Latex painting, cutting in lines, hard-to-reach surfaces. No. 28. Small flat, long-haired Brush/white bristles Uses: Oil paints. No. 29. Flat 2 1/2–inch Brush/white bristles. Uses: Oil-base coating; squared-off ends; general purpose; precision edges,/trims. Nos. 30-32. Round Bristles/white. Uses: Oil glazing; oil-based painting. TIP: Use separate brushes for separate functions. No. 33. Well-worn round Brush. Uses: Stirring paints. Decorative painting can create warm, personal spaces from bland, contemporary walls. It can create focal points out of any surface such as doors, trim, woodwork, even ceilings. It can create masterful heirlooms from worn, discarded furniture. It can transform jeweled and gold-leafed treasures from thrift shop and yard sale finds. Decorative painting – creating the “right surfaces” – can make a room, area or piece come alive. Underscore or downplay its assets, and camouflage its drawbacks. Add new life, a new feel. Blend the old with the new – family antiques with store bargains. Make newer surfaces appear very aged, hundred-to-centuries old. Create a special, and different, touch with every applications, every tool on every surface. With decorative painting, you can create a signature piece from every piece. Paints used. On top of two layers of interior paint, you apply two thin coats of transparent paint – “Glaze” – that you mix, then tint to the desired hue. Colors. At the heart of decorative painting, especially when carefully chosen and properly mixed. Produced by blending wet paints on palette, then placing translucent layers atop an opague base/ Result: Resonance, depth, a subtle glow as mixing. Pattern. The way you apply glaze contributes to uniqueness of each application. Using a wide array of tools, multiple shapes and sizes. You manipulate the glaze while wet to form patterns or different broken-color effects (eg. ragging, combing, sponging, flogging). Decorative painting calls for creativity, skill, and patience. It alls for paint and finishing products that suit the surface and areas. It calls for the appropriate tools to achieve the desired pattern, texture, finish, and effect. IS DECORATIVE PAINTING A GOOD OPTION FOR A SURFACE WHERE YOU PAINT? Are guests of your hotel ready for unique surroundings and surface embellishments? Are the patients and staff of your hospital looking for alternatives to the opague paint colors on the walls and in public areas? Are your commercial clients seeking a personalized alternative to wallpaper? Or, does your private customer want something other than the area rug to dress up a wood floor? * Photo and descriptions from: Recipe for Surfaces: Decorating Paint Finishes Made Simple. Text by Mindy Drucker and Pierre Finkelstein. ** Photographs by Tony Cenicola. Copyright 1993, Quarto Inc., Fireside Books, Simon and Schuster, N.Y., pp. 42-43. Mindy Drucker is a freelance writer, specializing in design and home decoration topics. Pierre Finkelstein is a master decorative painter. He is recognized worldwide for his skill in applying standard, matching existing and creating custom finishes. Born in Paris, he owns Grand Illusion Decorative Painting, Inc., New York City. “Painting with Bob” appreciates that you are following. “You get what you pay for” goes for paint and supplies as well. For the painter, it is important to get the best value out of the products chosen. Painting materials must guarantee some degree of durability to retain their worth over time. You look for something else if they don’t. What separates a quality paint product from one at the bottom of the barrel? One is a quality-formulated product; the other pretends to be one, particularly as they try to compete. Typically, you can rely on a paint product which is a high-end brand name. And within that, the most expensive is normally the best. The reason is research and development. When a company focuses on making a better, longer lasting product, the result should be a more durable product. At the same time, the manufacturers of all higher-end products do try to make improvements to even their lower-end, cheaper materials. volume of solvent. CAUTION: Some paints have more water than they should. paint is not manufactured by a foreign subsidiary of main brand. product has UV protection. TIP: If it doesn’t the surface may oxidize faster. binder percentages in paint are equivalent to similar priced and types of paint. viscosity test level information. TIP: My opinion: Paint is worthless if the material is too thin. “Paint with primer” added is a misnomer. CAUTION: The chemistry of either cannot be combined to produce the same results as when the primer is applied by itself, then later the finish paint. About Primers. A primer bonds to the surface. It provides a porous anchoring surface that the top coat to which it can bond effectively. “Paint with primer” products skip one critical step. Be careful about this, especially if you’re an experienced painter. The time and money you think you are saving, along with the idea that your work has become easier, diminishes the actual quality of the job itself. You could be painting something twice in a year instead of once. Now, who has the best Paint? The two central choices are Glidden and Sherwin Williams. They have a long and valued reputation for making high quality, long lasting and moderately priced coatings. For the price, they are also the most diverse in their product types. Sherwin Williams, by far, has the best industrial line. In its response to the residential market, the Behr paint line is exceptional, as well, although the pricing is somewhat higher than Glidden. For stains, Minwax and Olympic are without real competition. They also have a long history behind them. In the automotive industry, I would rate DuPont as the best option. What are the most durable paints? Two-part Epoxy products for commercial/industrial corrosion and abrasion resistance. Within reason and knowledge of these products, they may be purchased and applied by the general public. I once painted a smoke stack with a silicon, heat resistant alkyd paint. The label said the product was resistant up to 600 degrees Farenheit. After two days of curing, the smoke stack was put back into service. That same day the paint bubbled and peeled off, sending sheets of paint floating to the ground. It had been shown that the temperature of the metal heated to a consistent 625 degrees. Was it the paint product’s fault? Several days later, I repainted the stack with another heat resistant product. This time it was a high-heat, aluminum fibered material. Once the stack became heated, everything turned out fine, no loose or peeling paint. In this case, I said it was the paint. Go figure. Every experienced painter has a less than favorable on-site story to relate. Hopefully, yours had a positive ending, like mine did. Eventually.